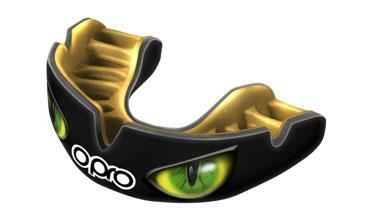 The OPRO Silver mouthguard for kids is a match level guard ideal for all combat sports including boxing, MMA and karate. What is the Silver UFC Mouthguard? The Silver mouthguard for kids from OPRO is the match level gum shield. The easy to fit and mould mouth guard is perfect for combat sports including MMA, karate and boxing. The fins that the guard has soften during the fitting process moulds itself around your teeth and contours of your mouth. In doing so you are left with a comfortably fitting OPRO mouthguard that stays securely in place. Thanks to the specially designed stretch zones, the mouthguard adapts to your mouth. This ensures it stays in place, without restricting your speech or breathing. How do I fit my OPRO Silver Mouthguard? Your UFC mouthguard is very easy to fit. Each pack contains instructions that are easy to follow. We also have a great easy to follow fitting video too. We recommend watching that before starting the fitting process. What sports can I use this for? This is an official UFC mouthguard and is ideal for all combat sports. However if you want to use it for any stick or ball sports, then you can do. It harnesses the same protection power of our silver level mouthguard. Ordering online from OPROMouthguards.com is easy and secure. Add your products to your basket and proceed through the easy to use checkout. Order by 3pm on any working day for next day delivery.